High end chocolates from Bolivia? You betcha! 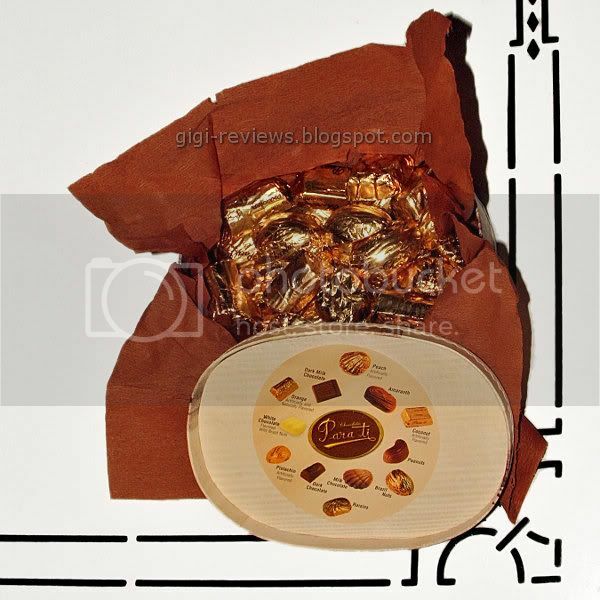 First, a big thank you to the kind people at Chocolates Para Ti for sending me this assortment to try. Prior their contacting me I had not heard of this company, so I was excited to check it out. While they are new to the U.S. market, Chocolates Para Ti is no newcomer to the world of chocolate. 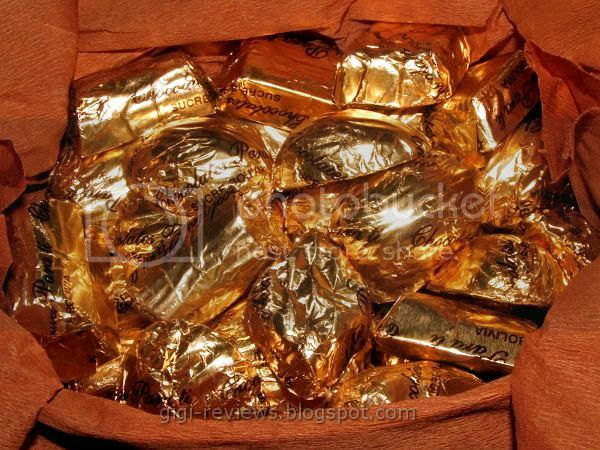 They have been making all kinds of yummy sweet things in Sucre, Bolivia, for over twenty years. There were 12 different kinds of chocolates in my box. 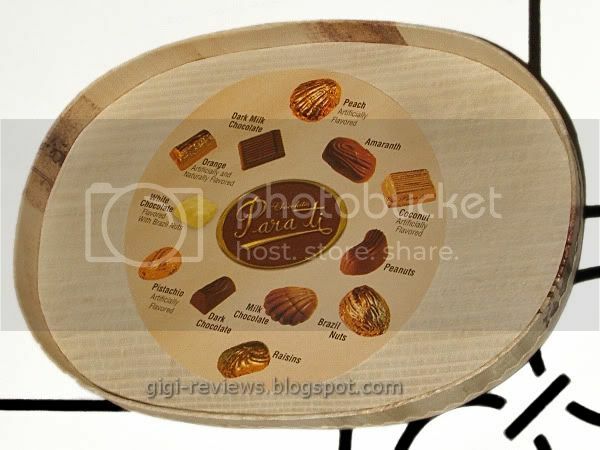 The inner lid of the box has a photo display of the assortment. 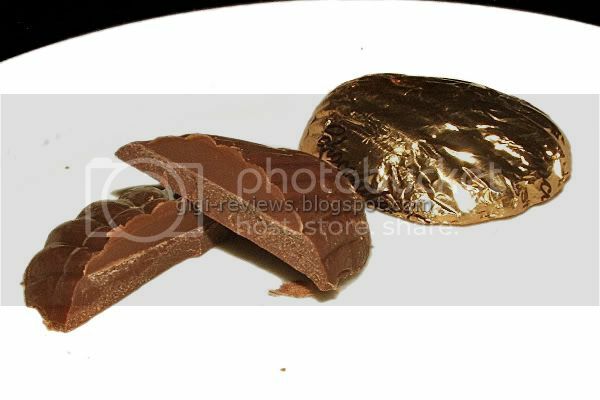 These photos are quite helpful, because each piece is beautifully wrapped in gold foil -- and while some are shaped like what they are flavored with, other pieces whose flavors are quite different are identically shaped. In any case, we're going to work clockwise around the label. 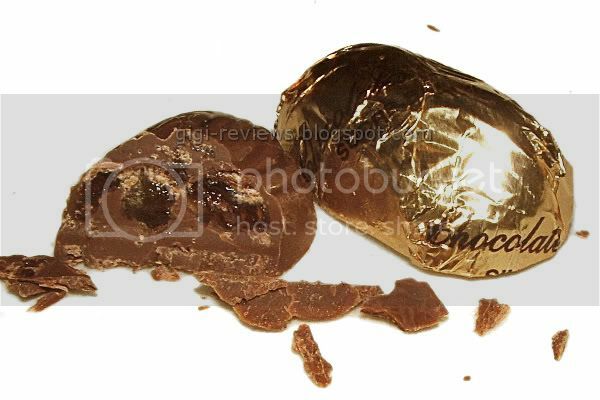 Most of the pieces use milk chocolate. And since there is a plain milk chocolate piece included, to save time I will put most of the chocolate info into that piece's description unless something else really stands out. 1. 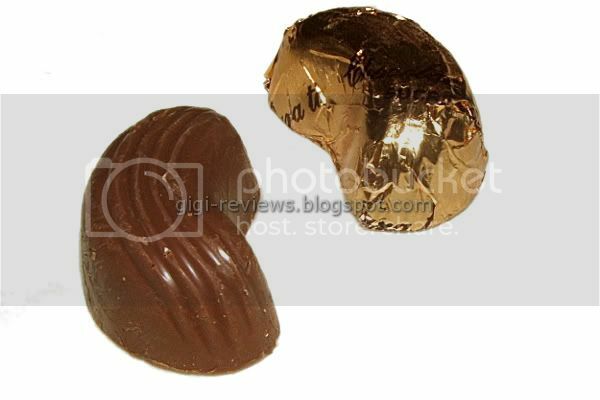 PEACH: Hidden inside the center of this shell-shaped milk chocolate lies a little dimple of peach flavor. It's a strong peach, sort of like what you would expect to find in a flavored iced tea. It's artificially flavored, but it's good. The peach leaves a nice fruity aftertaste. 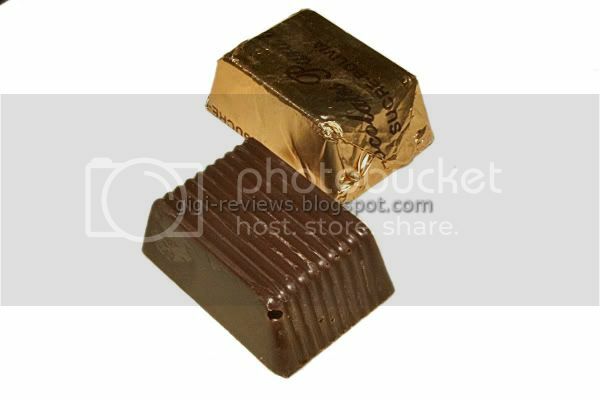 The melt of the chocolate is very smooth and creamy. 2. AMARANTH: I actually had to check the Wikipedia entry for amaranth because I was not sure what it was. But I like it when ingredients stump me, because that means I'm going to taste something I have never tried before. Turns out that amaranth is a "cosmopolitan genus of herbs." There are 60 different species that are considered to be in the amaranth family. Among them is a grain version -- and that is what is used in this candy. The little pieces of amaranth were each about the size of a small sesame seed. The flavor was really interesting. It was like a combination of toasted coconut, rice, and sesame. It's crunchy but not hard. I also noticed a strong vanilla taste with this piece. 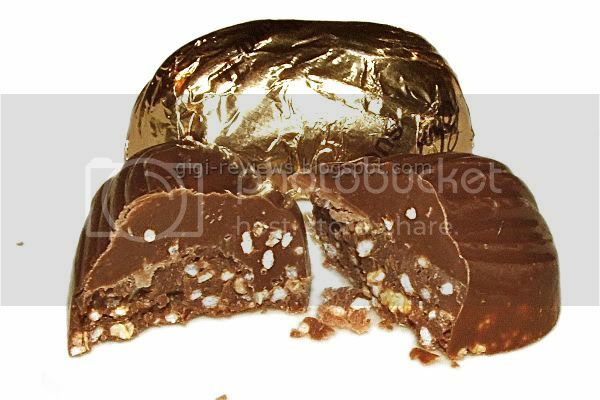 Mixed with the milk chocolate it made for a really fast nibble. There's not much snap to the piece, but the amaranth bits kept the texture interesting. The amaranth itself was so good I would really love to see it used more. 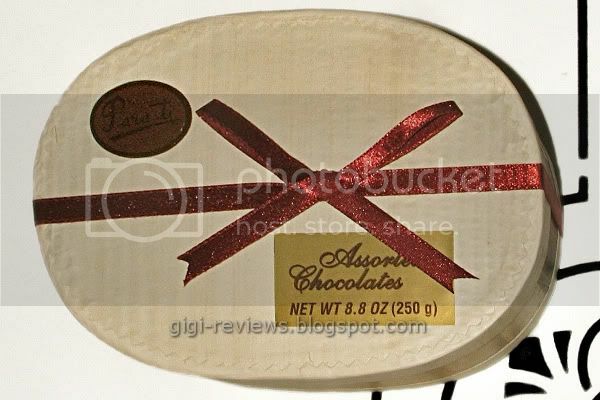 The chocolate seems a little grainy, but I think that is because it is so densely packed with the amaranth; not because of the chocolate itself. 3. COCONUT: Aaah, my arch nemesis -- coconut! OK, to be fair, I don't mind coconut flavor, if used sparingly (or in the odd fruity drink), or even toasted coconut. It's "raw" or mushy coconut I just can't handle. I hate the texture, and the taste...blugh. Now, luckily for me the piece is merely coconut flavored. The neat little brick smells vaguely like coconut and sugar (and I happen to like that combo). It's milk chocolate. It had great snap to it, and is just thick enough that you feel like your teeth really sink in. The coconut flavor (which is artificial) just hovers in the background of the chocolate -- sort of like if you took a really big bite of German chocolate cake that was thinly frosted. The dairy notes really stand out in this piece. As much as I hate coconut generally, I have to admit I liked this piece because it was so subtle. 4. PEANUT: I really liked that this was molded into a cute little nut shape (OK, it looks more like a cashew than a peanut, but do we really need to be that picky?). 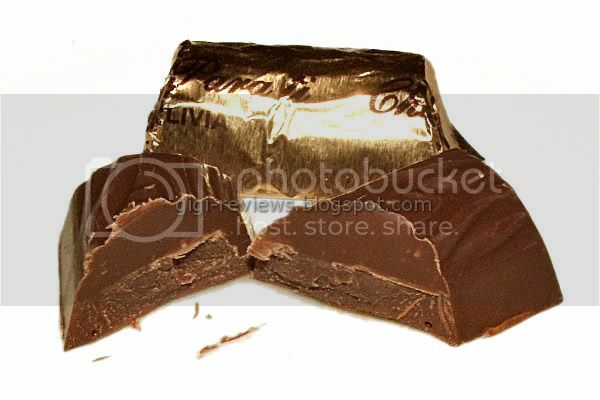 This piece is also milk chocolate. Before biting into the piece, I wasn't sure if it was going to have whole nuts or large nut pieces. In fact it had neither. Instead, the piece is studded with very small bits of peanut. 5. BRAZIL NUTS: Again, props for the cute molding. This piece was also molded to look like a little nut half. 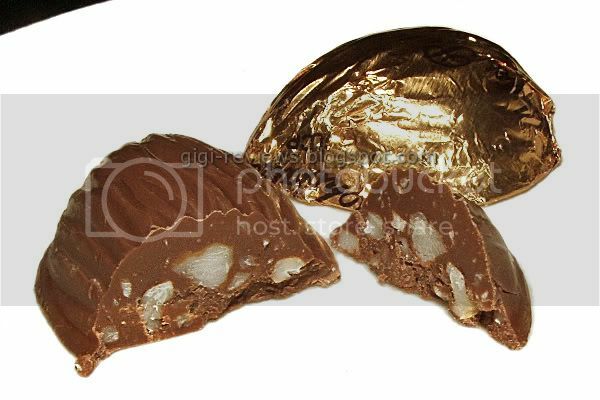 This is another milk chocolate piece. I feel the need to admit I do not as a rule like Brazil nuts, so take my thoughts on this one with a grain of salt. In this piece the nuts are larger chunks, and and there is no mistaking that they are there. 6. 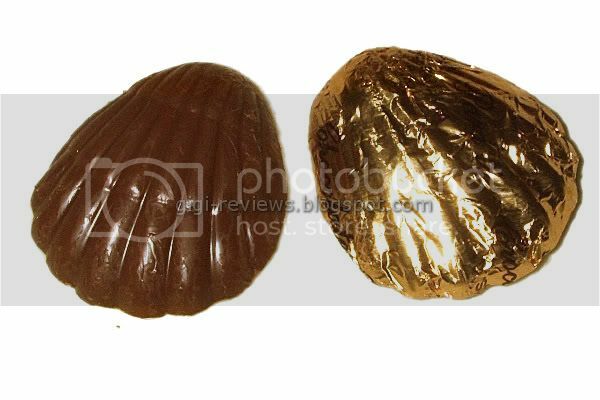 MILK CHOCOLATE: This one is also a shell shape, just like the peach. About the only way to tell them apart is that the plain milk is just a tiny bit lighter in color. It is very creamy and has a smooth melt. On its own, it is a little too sweet for me -- but I liked it when paired with the different flavors and nuts. I think it works better as a base for other flavors than it does as a standalone. This is yet another milk chocolate piece. Whole raisins stud the chocolate. It's like eating a giant Raisinet. 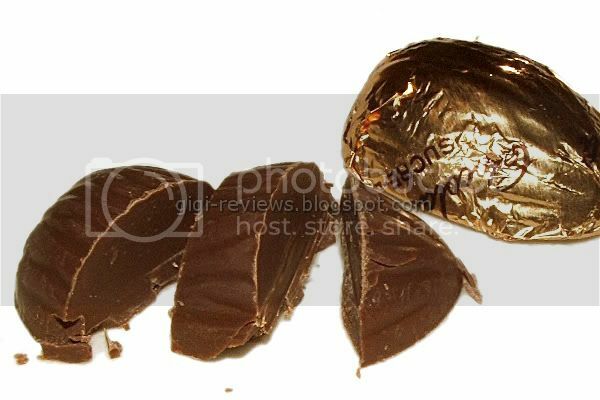 The raisins are plump and juicy and the chocolate is cool and smooth. This was one of my favorites. I could eat a full bar of this piece! 8. DARK CHOCOLATE: This is a 57% dark chocolate -- not the darkest on the block by any stretch, but not exactly a deep milk either. I am sure the Chocolates Para Ti people aren't going to like me for saying this, but the first thing that struck me when smelling the chocolate wasn't the expected woodsy notes, or coffee notes, maybe even cherry -- no, but this was indeed a familiar smell. In fact, it's an aroma I rather like under different circumstances. So what was that aroma? It smells exactly like Play-Doh! Yeah, DOH indeed! Smell aside, though, it does have a really clean snap and it is quite rich. (No Play-Doh taste, thank goodness.) It tasted to me at first like a chocolate covered cherry minus the cherry. Once the sweetness wanes a bit (about 5 or 6 seconds in) the flavor becomes very earthy. Kind of like...well, like lush, fertile tropical dirt. I know that doesn't sound like it would be good, but it is honestly addicting. It doesn't remind me of a traditional dark chocolate at all. But it is so good that I don't care. 10. 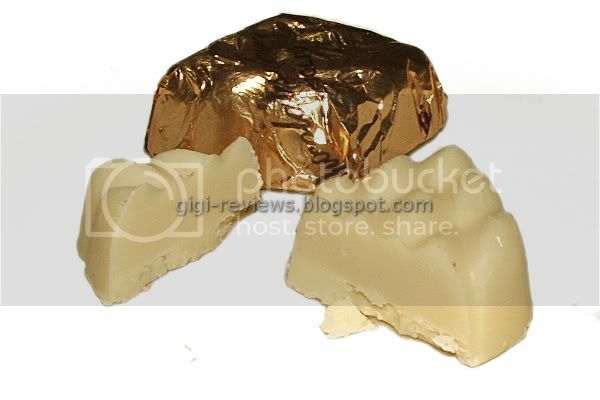 WHITE CHOCOLATE FLAVORED WITH BRAZIL NUTS: This is the lone white chocolate in the box. Again, I feel the need to voice my own biases against both white chocolate and Brazil nuts...so you have been fairly warned. The white chocolate is very soft and smooth. The single strongest taste is Brazil nuts. I am not sure why they went with simply Brazil nut flavor rather than actual Brazil nuts. Errrm...what else...did I mention it was white chocolate? Honestly guys, I don't want to be unfair to this piece because it was made up of two flavors I don't like. If you are a fan of either flavor, I am willing to bet you would like it a lot. Dammit, where's Jim when I need his input? EDITED AFTER ORIGINAL POST TO ADD: Again, my thanks to the folks at Chocolates Para Ti for passing on a little more information about this particular piece: The Brazil nut flavoring that you taste in this piece is real Brazil nut that has been crushed up into a fine powder/paste that is then mixed in with the white chocolate. So for you white chocolate/Brazil nut fans, this sounds like it is a really spiffy piece! 11. ORANGE: Must I once again proclaim from the mountaintops my love of orange and chocolate?! This piece is no exception. The flavors reminded me of an orange jelly roll with no jelly. You know that zesty, sweet orange taste? It's just like that. (The chocolate, again, is milk.) I really liked this one! 12. DARK MILK: Last but not least is the 46% dark milk brick. Interestingly enough, the dark milk tastes darker than the actual dark chocolate. It made me think of what the the love child of a Hershey's Special Bar and raw Devil's Food Cake cake batter would taste like. Clearly, 11 different shades of awesome! It's a little woodsy, but there are some deep cocoa notes. The cherryish flavor is still there. It does have a nice milky finish. In the end, I loved some of the pieces -- the amaranth, the deep milk and the dark chocolate in particular. The assortment as a whole was good mix. And even with the pieces I didn't like as much, I have to admit it was because they contained flavors I don't care for in any circumstances, rather than because of anything that Chocolates Para Ti did or didn't do. Yep, this box made me very happy. If you want to try something different, or you want a gift for a foodie that's way off the beaten path, this could be just what you are looking for. 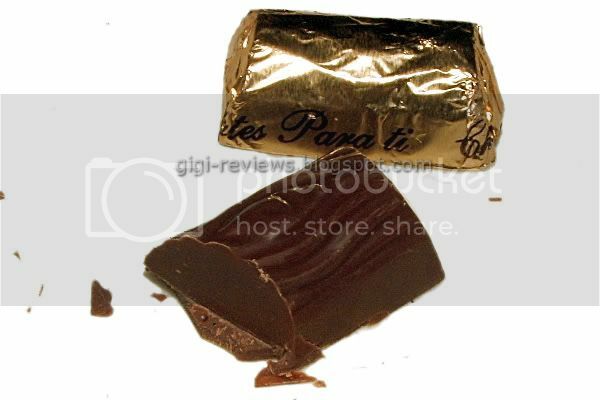 Be sure to visit the Chocolates Para Ti website to see their full selection of products, and for ordering/shipping information. I have never heard of amaranth but it looks pretty interesting. 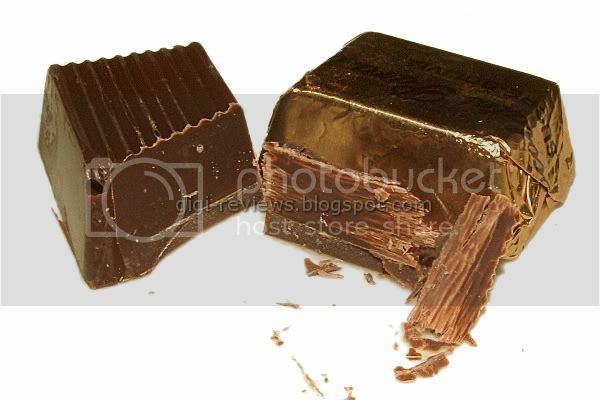 I'm always a big fan of chocolate with texture to it. The white chocolate and Brazil nut flavored one also looks intriguing.